This characteristic agriturismo, housing four apartments and a swimming pool, is situated in a hilly region in the Tuscia area, the land of the ancient Etruscans. The agriturismo is located on a 420 meter high hill and offers fine views across the surrounding area. The altitude and the mild climate make for pleasant summers with plenty of sunshine and a gentle breeze. 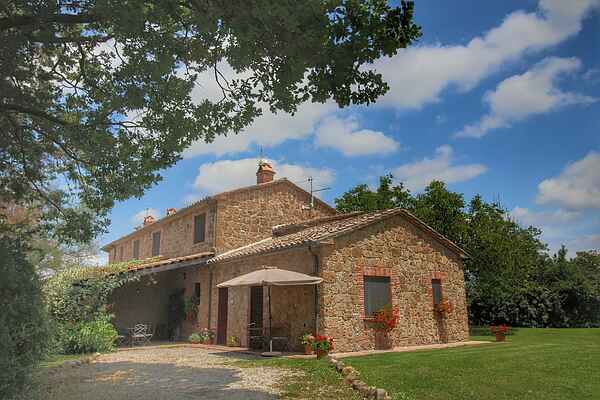 This typical, traditional farmhouse has been fully renovated and equipped with modern comforts. Wheat, sunflowers and corn are grown on this farm and you may also see the cows grazing in the valley. The agriturismo is surrounded by a large garden filled with plants and flowers. This is an ideal, tranquil place for a holiday in natural surroundings. Perhaps you'll be woken up by the birds' twittering and the crickets' chirping. Nearby the house you'll find the panoramic swimming pool and sun terrace which boasts a view across the Paglia river and the surrounding hills. There is a horse riding school, tennis court and football pitch nearby. The owner would be happy to tell you more about this.